Sometimes living on ink also means flying on it, too. I find myself in the Chicago airport on New Year's Eve, and God willing, I'll land at my final destination in enough time to sing that damn song that I can't spell about old acquaintances. I'm not big on flying. For me, it's all about the right shoes. By no one's standard am I a fashionista. I choose comfort about 85 percent of the time over style. That doesn't mean I wear sweats five out of seven days. I actually don't like sweats, but I want to feel good in what I wear, and if the possibility exists that I'll have to run with luggage from point X to point Y, then, I go for tennis shoes. 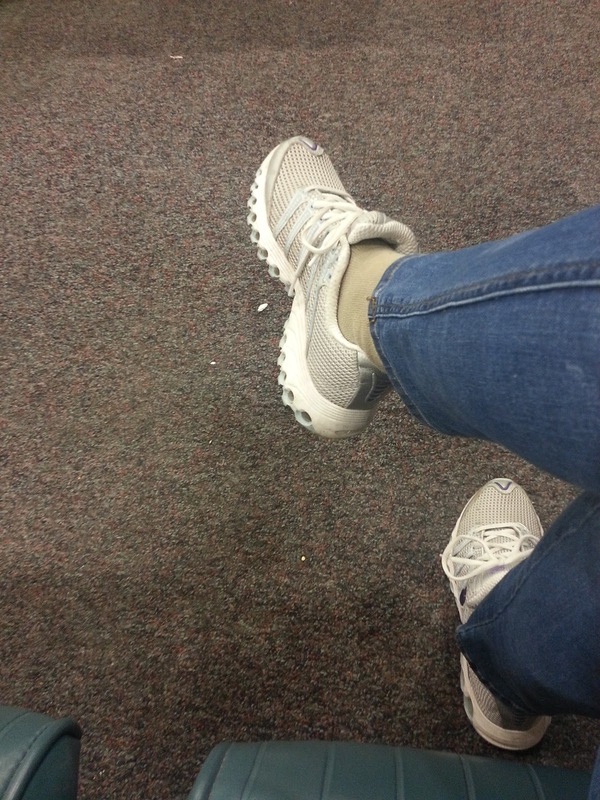 For the most part, women don't wear tennis shoes out in public unless they are working out. Or, if they are young women. Or very old women. Today, I am neither; I'm being practical. Tennis shoes it is. An airport is a funny sociological study, if you have time to contemplate it (which I do because I have a massive layover). I just deboarded a plane that couldn't be more than a few months old (I overheard a steward say so; it was a flight with all male stewards. No explanation.) Now I sit in an area where the vinyl seating is ripped, the carpet has obviously not been swept in a few days, and a chair next to me is broken. Wobbly. Afixed with a sign that reads Broken seat: Don't Use. The tape on the sign is not sticking anymore. I've walked all of a half mile and gone from big city glitz to Podunkville (check my spelling on that). What does this have to do with the writing life? Not much, other than I wanted to send the year off with a wave and a nice kick in the pants. 2012 could have been better. I could have written more. I could have published something. But, I keep trying. New Year's Day is for regrouping. Shaking things up. I don't make resolutions, but I do reflect, and I'd like to reflect less in 2013. I want to DO. Good thing I don't mind wearing tennis shoes out in public.